Here’s the legitimate, safe and legal way to download free musics, songs or MP3s from the Internet, using the same concept Google famous of – “ad-supported”. We7, a UK based website, promised to deliver and offer free music and songs download without any DRM, so that users will be able to play music downloads for free, when and how they like, and even share DRM-free music downloads legally with friends. All with a small price of simply hearing an audio advertising message for up to 10 seconds or less on the music tracks that users download for free. 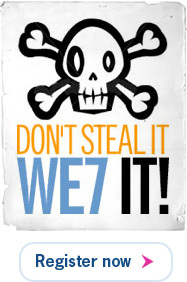 If the business model of We7 can succeed, it’s not short of a digital music revolution, which previously haunted by high degree of online piracy. We can forget about illegal MP3 download sites, torrent sites or ed2k sharing downloads. Money that spent on online music stores such as iTunes, Rhapsody, BuyMusic, MusicMatch, Urge, Sony Connect, Zune Marketplace, Urge, Emusic and Walmart Music to buy audio files can also be saved. We7 is currently in beta and hasn’t signed up any major labels. The venture is currently working with independent record labels, featuring artists such as Youssou N’Dour, Public Symphony, Capercaillie, Jon Christos, Diana Galvydyte and Jakob Fichert, Afro Celt Sound System, Big Strides the Dave Matthews Band and Hall & Oates. This may be one of most important Achilles heel of We7. To success, more soundtracks from top artists and hot up-and-coming songs are needed. For those who especially love a particular music track, but hate the ad, will have a choice to purchase the track directly, which comes in higher bitrate. To get your free music downloads, simply add the song to your playlist, and then download the free MP3 from there. You can also download your playlist as podcast (RSS feed). Join the free music downloads resolution at We7 (defunct).